The ball is in contact with the racquet for only a couple of milliseconds, but those few milliseconds are crucial to hitting an effective shot. If the racquet face is anything but vertical there will be virtually no chance of putting topspin on the ball. Topspin is what all advanced players hit on most of their shots. If the ball is hit off center the racquet will be less stable which can lead to errant shots, Off centered shots are also much less powerful. 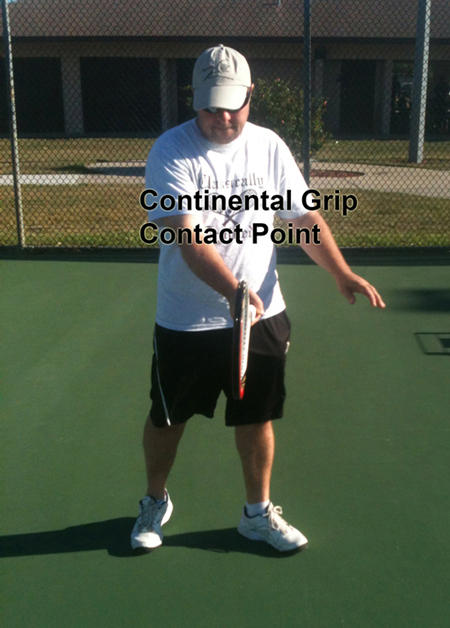 The ideal contact point of the forehand varies depending on what grip is used. The ideal contact point is the position where, as the racquet swings forward, it gets into a vertical position without any movement of the wrist or forearm. 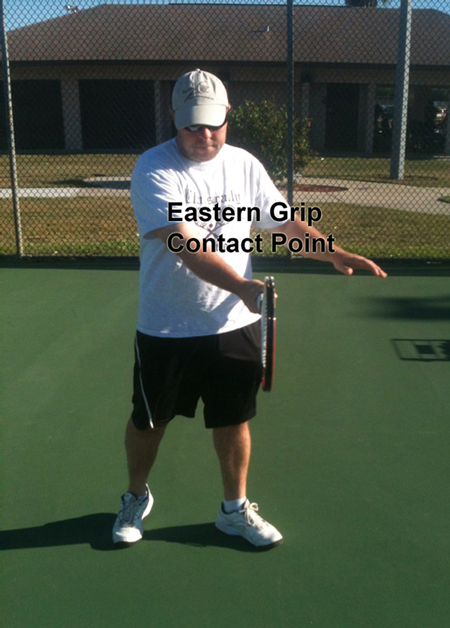 An Eastern Forehand grip puts the ideal contact point lower and closer to the body then a semi-western grip. Hover over the below image to see the difference. There is an even greater difference between an eastern grip and a western grip. Hover over the below image to see the distance. 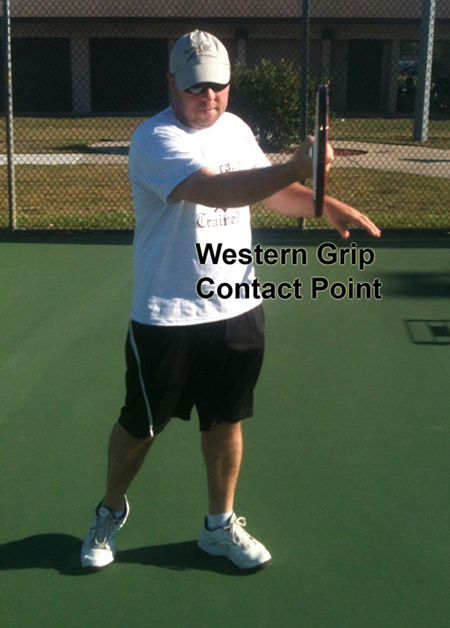 A major reason players who specialize in playing on clay use a western grip is because the ball bounces higher on clay and a western grip makes it easier to hit higher bouncing balls. When grass was the dominate surface (pre 1970’s) the continental grip was used for most shots as this allows for a lower ideal contact point. Of course contacting the ball in its ideal position doesn’t happen every time, but using a specific grip makes it more likely that the ball can be hit in its ideal position or relatively close to its ideal position. Even when shots are outside of the ideal contact point, certain grips can make hitting these balls less difficult by putting less stress on the arm and body. Hitting balls not at their opponents ideal contact point is the specialty of advanced players. It is very beneficial for them to keep the ball from the ideal contact point. By keeping the ball away from their opponents ideal contact point they can make them uncomfortable when hitting the ball. Everyone has a specific position that they like to hit the ball in. Of course there are ways to hit the ball at the ideal contact point even when the opponent is trying to keep it out of that zone. For low bouncing balls that never get up to a players ideal contact point there is not much that can be done to get the ball there. One thing that can be done is bend the knees. The lower the ball, the more the knees should be bent. If the ball is really low, the knees will need to stay bent while contacting the ball which makes it very difficult to lift the ball over the net, but this is a viable option. 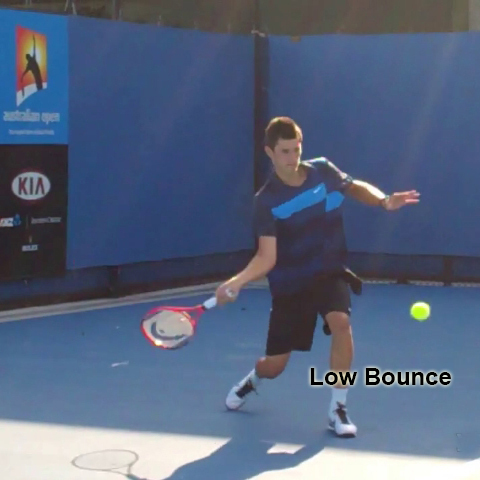 Another option for low bouncing balls is to switch to a less extreme grip. 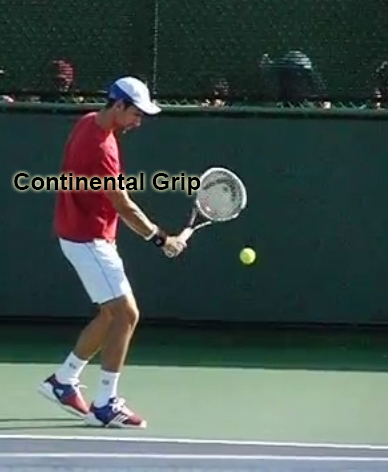 For real low balls a continental grip can help to make hitting the low ball easier. Another, less ideal option, is dropping the racquet head. This option should only be used for balls that are really low (less then 12 inches off the ground). This is the only real option for balls that are this low. The knees should still be bent and a less extreme grip should be used as well. Luckily balls that stay low are generally hit with underspin and they tend to float and be more defensive type shots. This makes it easier to handle these types of shots. Offense underspin shots tend to skim the net and to not be a very high percentage shot. The more advanced the player the less likely they will be to hit underspin with a high degree of regularity. This means advanced players do not have to deal with low bouncing balls very often. For lower level players who play against players who hit underspin regularly there is an easy solution that can minimize the impact of balls staying low. 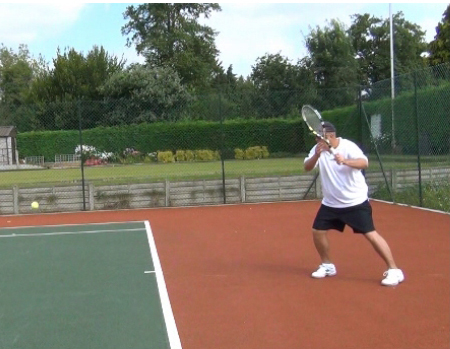 Just be aggressive and move towards the net and volley the balls that are hit with underspin. 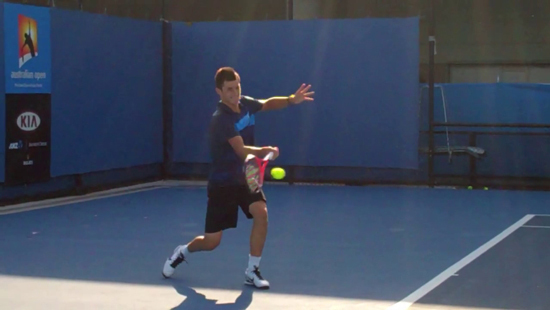 As soon as a player shows the sure signs of hitting underspin, run towards the net and volley the ball. 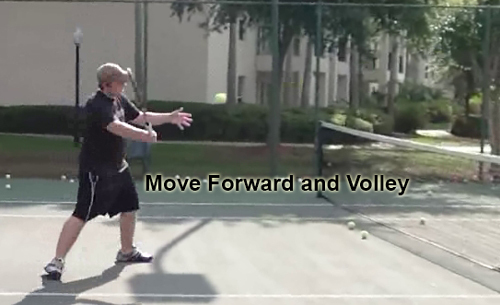 The ball should be easy to volley as it will be moving slowly and floating. Balls that bounce higher then the ideal contact point can be very tough to handle as people do not like hitting balls that are much higher then their waist. Balls bouncing above shoulder level are especially tough. Luckily for good players high balls can be handle simply by not letting them get so high by hitting the ball as it is rising. 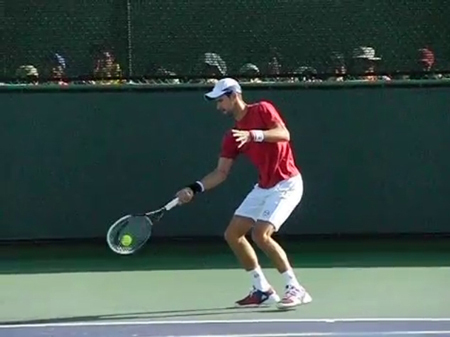 Hover over the below image to see Novak Djokovic hit the ball as it is still rising. Hitting the ball on the rise is not easy but with a little practice, its not extremely difficult. Another option is to back up and wait for the ball to drop and then hit it. Hover over the below image to see this happen. This is a strategy used by more beginner and intermediate level players. The problem with doing this is that it makes it very difficult to be aggressive. 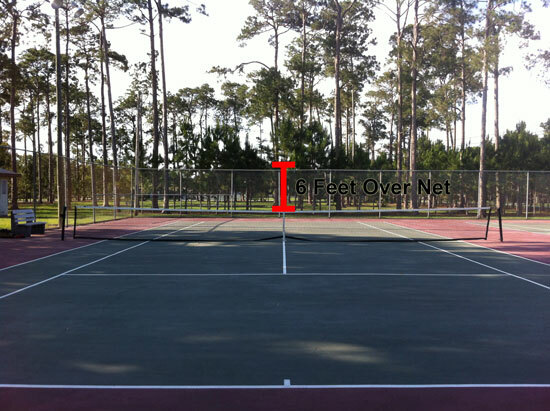 For every foot behind the baseline that the ball is hit it should clear the net by an additional foot. From the baseline the ball should be hit about 6 feet over the net. So if it is hit from 5 feet behind the baseline, the ball should be hit 11 feet over the net. Hover over the below image to see the difference in height. 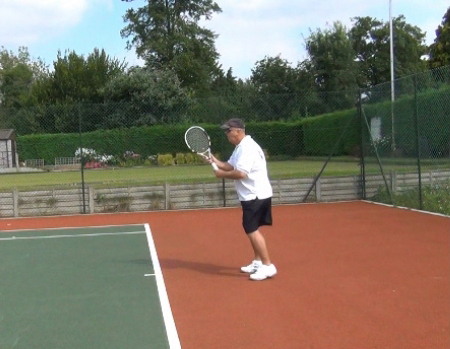 The higher net clearance is needed because as a player stands further behind the baseline the ball needs to be hit at a higher trajectory as it has a longer distance to travel. The higher trajectory allows the ball to travel further before gravity brings it down into the court. Additionally by backing up you are narrowing the court dimensions. Normally from the baseline there is a little less than a 20 degree zone that the ball can be hit in and expect it to land in the court. The farther behind the baseline a player stands, the smaller the degrees to hit in becomes. Backing up also means the ball will be hit later which gives the opponent more time to recover for the next shot as not only does the ball take longer to get to you, but it will take longer to hit the ball back to the opponent as it will have farther to travel. Of course if this makes it so the player is more likely to get the ball in the court, then backing up is a good option. Some professional players would rather let the ball come down instead of trying to hit the ball on the rise. These players will just start further behind the baseline. That way they do not need to constantly be forced to back up. 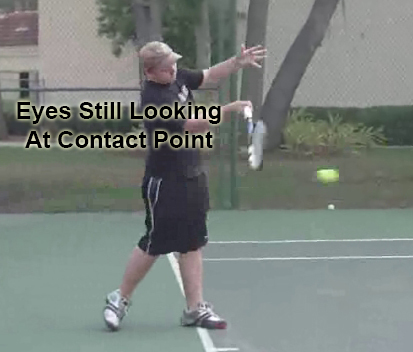 The contact point will also vary based off of the height of the ball as well. The higher the ball, the more out in front and the higher the ideal contact point is. Other variables are generally self-made and should not be factors on where your contact point is. At contact the racquet face needs to be completely vertical to the ground. This is the only way to impart topspin on the ball. 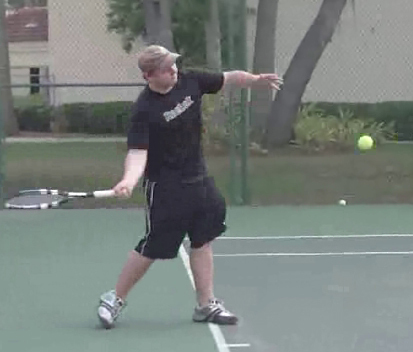 Even a 5 degree change in the racquet face will not allow sufficient topspin to be put on a tennis ball. 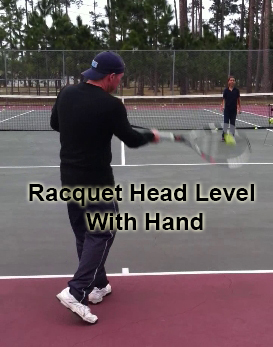 The racquet head should also be at the same height as the hitting hand. 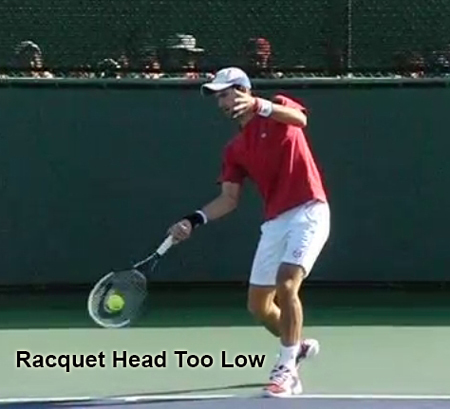 Some players will have the racquet head lower then the rest of the racquet at contact. This will make the racquet head less stable and lead to erratic shots. It will also amplify the effect of off-centered shots. Off-centered shots will generally cause a loss of power and make shots less consistent. 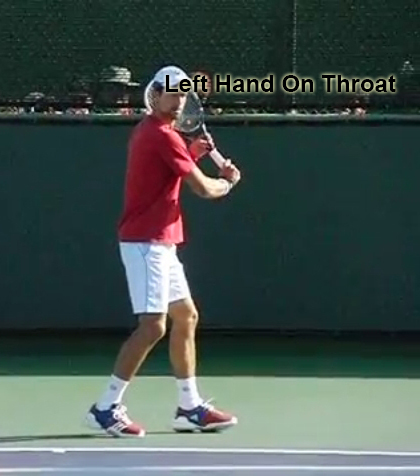 The racquet head lower than the hand also makes it easier to move the wrist before contacting the ball. 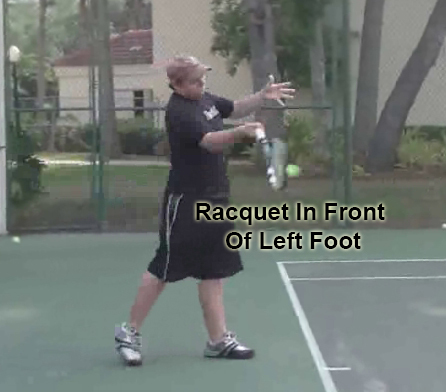 The racquet should be in front of the left foot at contact. This should also happen automatically with an eastern or more extreme grip and a 30 degree bend in the wrist. 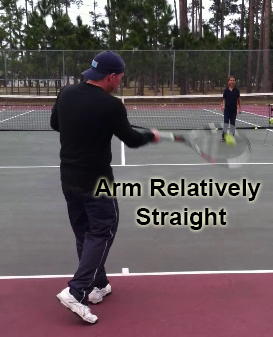 A relatively straight arm will also help get the contact point in front of the body as it also puts the racquet more in front and well off to the right of the body. The farther away from the body that the racquet is, the more power that will be generated as the further away the racquet is the faster it will have to move. For a more in depth explanation click here. As mentioned above, the hitting arm should stay relatively straight at the contact point. The forearm should not have rotated. 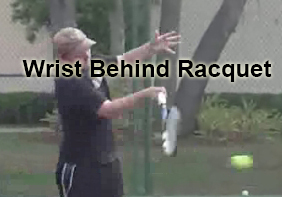 Any rotation of the forearm will tilt the racquet and make it impossible to hit a clean shot. 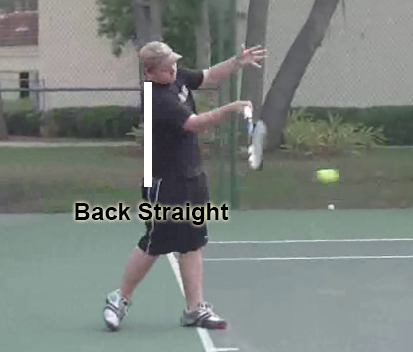 The wrist needs to be behind the racquet as the ball is contacted. This should happen automatically if using an eastern or more extreme grip especially with the 30 degree bend in the wrist. 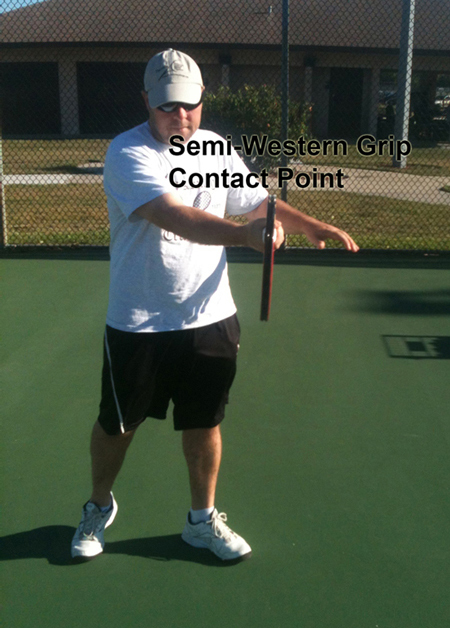 By the wrist being behind the racquet, the contact point will be further out in front of the body. The whole body behind the ball will give a more powerful swing. The wrist should still be locked and not moving at contact, again the 30 degree wrist bend helps to maintain a firm wrist. The belly button should now be pointing towards the net post. This will give proper balance while contacting the ball. If the belly button is too much towards the side fence the shoulders and hips are not rotating enough at this stage of the swing. This will lead to a substantial loss of power as the trunk rotating forward is a huge source of power. Most likely the arm will be forced to be the main power supple for the swing. If the belly button is past the net post it has over rotated at this stage and most likely the swing will end up being horizontally instead of vertically. Hover over the below image to see how over rotating can cause a vertical swing. This also means the shoulders and hips are most likely not decelerating enough and the kinetic energy chain will be broken forcing most of the power to come from the arm. The front leg should be relatively straight at contact. The back leg will be loose and most likely have a bend in it, This will help the bodies center of gravity move forward. 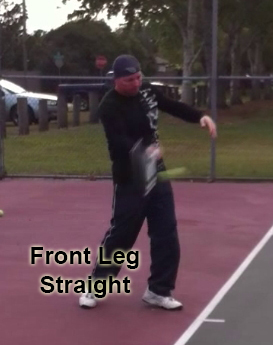 The front leg being straight and not moving helps the kinetic energy chain transfer energy to hitting arm and racquet. Unbending the legs will help lift the ball over the net. Too much of a knee bend at this stage will most likely mean not enough lift is being created to help the ball get over the net. Body weight should be mostly on the left foot at this position and continuing to shift onto the left foot. 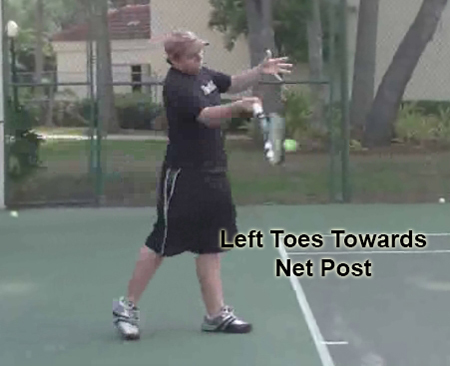 The left foot toes should continue to point towards the net post. This helps to keep the swing vertical and is a good indication that the foot has decelerated properly. Toes that end up pointing towards or past the net at this stage mean that the leg hasn’t decelerated enough which means power from the kinetic energy chain will be lost. 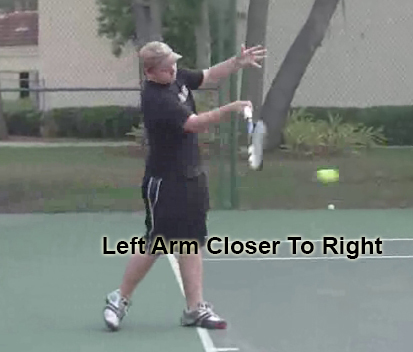 The left arm will have decelerated enough so that the right arm has closed the distance created initially during the racquet drop and forward swing. Hover over the below image to see the distance between the two arm get closer. 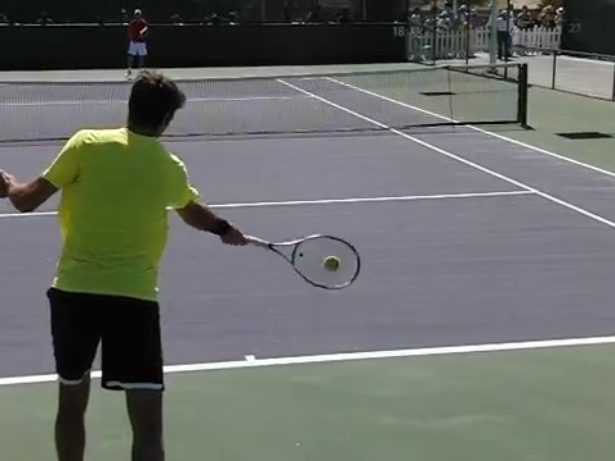 Notice that the left arm doesn’t really move very much from the bottom of the racquet drop to the contact point. 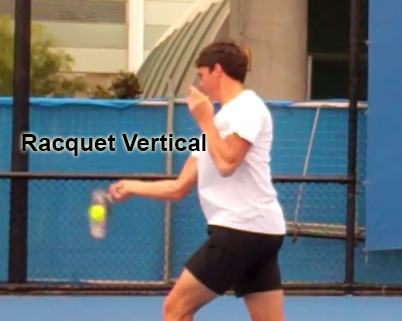 This deceleration plays a crucial role in the acceleration of the racquet. As the left arm starts to slow down by reaching its destination, it speeds up the right arm. 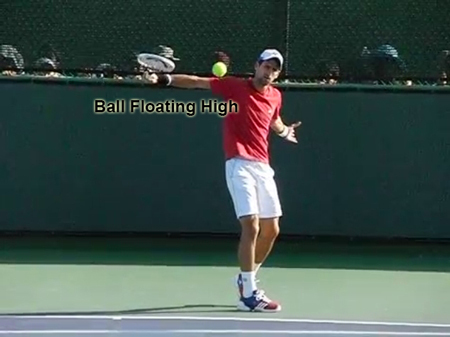 This is especially crucial at the contact point as this is the point where the racquet should be moving its fastest. This will help to generate the most power. The back should continue to remain straight. There is some times a slight tendency at this stage to start to arch the back to help with the lifting of the ball, but this is not needed if the swing is done correctly. Even if the swing is not done correctly the back should not be arched as this can lead to back injuries. The head should be looking at the contact point. This seems like an obvious thing to say, but because the brain thinks the ball is hit before it is actually hit, many players will have already started to look up to where they think they are hitting the ball to before they actually have hit it. In the below image the ball has already been hit. By looking up early, the racquet will move down as the head moves up. 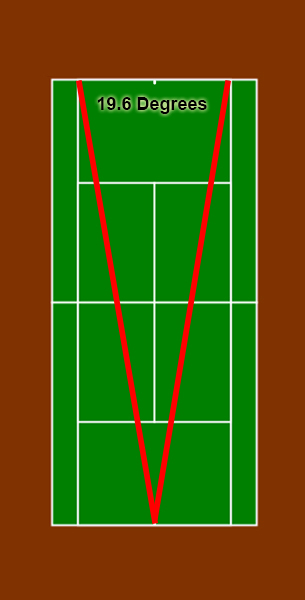 Players who often take their eyes off the ball early hit the frame of the racquet a lot. Almost every time a ball hits the frame, the head has been moved early.